With International Women’s Day just a week behind us, there has been a lot of talk about gender equality, the progress made along the years, and what it means to be a 21st century woman. Articles and related topics trended on social media. One such topic is the Ban Bossy campaign launched by Sheryl Sandberg, Condoleezza Rice and Beyoncé. The Ban Bossy campaign highlights the reality that young girls and women are faced with from a very young age; the negative stereotype associated with girls being seen as leaders. Its aim is to create awareness for the support of female leaders and to encourage girls to lead. The campaign claims that as early as primary school, girls are taught to be communal, supportive, and to speak when spoken to. Whereas boys should be assertive, strong and ambitious. The word “bossy” is often used alongside other labels such as “aggressive,” when referring to girls and women who are, like most men, assertive, strong and ambitious. Ban Bossy says that it is these stereotypes that hold women back and subsequently hurt economic performance. They believe that companies that have more women in leadership roles are more productive and achieve better results. Growing up in rural South Africa where gender lines were distinctly drawn, I can testify that, although I was brought up in a house full of strong women, there was gender bias in how girls were brought up, disciplined and encouraged (or discouraged), versus a boy child. Boys were always encouraged to go out into the field to play with other boys without supervision, whereas as a girl I was expected to not leave the house unless I had been sent to run an errand for my grandmother or one of my aunts. A girl could not venture off and explore, or adakase (stray), as they would say. She needed to stay in the house, do chores with the other women in the household, and play house when there were no more chores to do. This already taught me that 1. I could not dream bigger than my male peers, 2. whatever I wanted to do, I needed the supervision of a male figure, 3. men could pursue any dream, and that for a girl to do the same would be stepping into dangerous territory. This was the theme even in school. The majority of sports were, and still are to this day, very much gender based. In the few sports events where both girls and boys could compete, it was always expected that a boy would win, and so when competing in a cross country race, I only saw other girls as competition, and boys only saw other boys as competition – because boys are too strong for a girl to beat, and girls are too weak to lead a race. If for some miracle a girl performed better than a boy, she was labelled a tomboy, one of the boys, too masculine or something to that effect – because 100% girl material couldn’t possibly come on top in a race with boys. So from this, girls are shaped to believe that where performance matters, top position is reserved for males, this transforms itself into so many other spheres in a young girl’s life, and well into their adulthood; that women cannot be leaders without the associated negative stereotype. I feel this is what the awareness the Ban Bossy campaign seeks to create – changing the mindsets of girls, boys, men and women to believe that women can effectively lead, and to encourage them to aspire to lead. As a young professional woman now, I have experienced gender bias in the workplace, particularly at times when I have exhibited leadership skills; where I have needed to be direct in addressing certain issues, making decisions or just simply promoting my ideas. Gaining support from coworkers or management has been met with more challenges than is experienced by male coworkers on a similar level. As a result, I have sometimes fallen into the trap of carefully considering every single decision and idea before putting it forward. On the contrary, my male peers often feel encouraged to make riskier decisions without being labelled as irrational, impossible, or even running the risk of being less liked. In fact, they get more credit for their suggestions, even those that end up in project failure and costing the company. I have witnessed this with other women, where they felt unfairly evaluated come performance review time. Feeling harshly judged in the workplace, I could have decided do what a lot of women do; which is to ignore the fact that I am just as (and in some cases more) competent as the men in my team and participate less in discussions, put forward less ideas, and not speak up about issues I feel strongly about. That could place me in the “most liked” box because I am “well-behaved” and “stay in my place.” But I didn’t. And so the labels come and go, and for many other strong, beautiful, capable and ambitious young girls and women who want to lead without being called “bossy.” Sadly, it is not always easy to stand that ground, more so in male-dominated fields where leadership roles are predominantly filled by men. For this very reason, women need to be conscious about supporting and building up each other. The Ban Bossy campaign is creating awareness and highlighting the fact that we all can play a role in encouraging the feminine gender to become leaders – from parents to teachers, managers, and as peers. Women are tough on themselves as it is, and receiving negative feedback when trying to lead is just reaffirming that men rule the world. But the reality is that the dearth of women in leadership roles impacts all of us, and fortunately organisations are beginning to recognise this. We need a society that allows girls to create opportunities and make decisions about how they would like to lead, and how they want to contribute in changing the world. 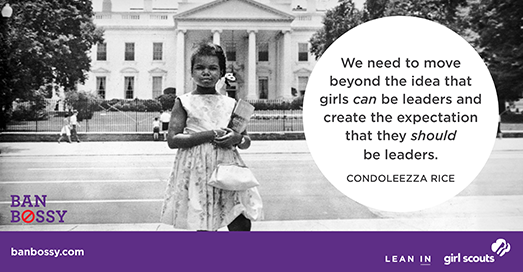 Women, too, want to lead impactful lives.